My dog Gizmo has been in Laurie's care numerous times now. She is absolutely amazing and Gizmo has a blast hanging out with her 4 dogs. She sends me pictures and messages about Giz everyday. I had put Gizmo in a kennel once and just couldn't do that experience again. 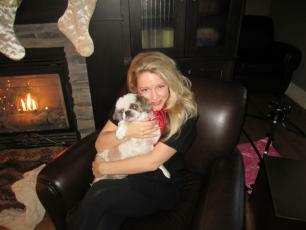 When Gizmo is with Laurie I know he is loved just as much as her own and she spoils him like crazy. He always has a smile and waggin tail on the way there and when we greet him at the door to pick him up. I can definitely say that I enjoy my holidays more now knowing that Gizmo is in her care. I would highly recommend her to watch anyone’s dog! I can't thank you enough for the love and care you and your family provided to Daisy while the girls and I were away at the dance competitions. You immediately put our minds completely at ease which enabled the girls and I to focus on their dances etc. We missed Daisy so much but it made a world of difference knowing she was being cared for like one of your very own. I will be giving you my highest recommendation to others I cross paths with about the care and obvious love and passion for what you do. We were so sad that we weren't able to access all the emails, videos and photographs you so lovingly took the time to send to us. We were able to view them this evening and the pictures speak for themselves - It is obvious that Daisy got lots of love, attention, cuddles and was part of your very own family! I am so grateful for your love, care, and patience in helping Daisy adjust while we were away and in making her first "socializing experience" so positive. Thank you so much for your positive words and encouragement for the girls as well! They thought it was fantastic that you and Daisy were cheering them on. Thanks to you, our first experience with having to leave Daisy in the care of another has been very positive and comforting. We now consider Tiny Pawz Bed Bark and Breakfast Daisy's home away from home. I am so glad I came across your advertisement and very grateful for you accommodating us by taking Daisy on such short notice. My apologies for being so late in arriving to pick her up this evening and I thank you for taking time to accommodate our later arrival. 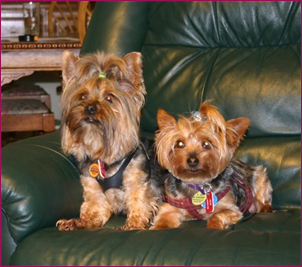 Hi, our names are Tinkerbelle & Sassy and we are very proud to recommend our Auntie Laurie’s new Bed, Bark & Breakfast to all anxious “parents” and furry little “kids” like us! Laurie isn’t really our Auntie, but we call her that because she rescued us and gave us a second chance to find our FUREVER home, which we did! Not only is Auntie Laurie the prettiest doggy caregiver, but she is the kindest. She absolutely loves all little doggies and takes the BEST care of them! Spending time with Auntie Laurie in her new POSH PAD especially designed for the comfort & pure enjoyment of little dogs like us, is like taking a vacation! You just have to “check-in” at her Pad and check it out! See you there! I first met Laurie Burton when I became involved in rescuing 22 Yorkies and Miniature Pinschers after my ex-husband passed away suddenly. I was distraught, overwhelmed and did not know where to turn. I found Laurie through a rescue organization and over a period of three days she literally held my hand over the telephone while we tried to place these dogs, three of whom were newborn puppies. We were racing to beat a looming spring snow storm as these dogs were out in the country and in a different province from my home. Laurie had never met me, did not know me and yet became a life line for me. She personally took many of these dogs, including the mother and pups. She helped me find another organization to take the Pinschers. She spent hours on the phone giving me advice, keeping me calm. She sent someone to pick up a number of the dogs and brought them into her home. Over the next 18 months she continued to take dogs for me and place them in good homes as they kept coming back from the temporary emergency foster care homes. Her compassion and concern for the dogs cannot be overstated. She also was very knowledgeable about dealing with the dogs; both their physical and their psychological needs. Laurie personally cared for over ten of these dogs, bringing them into her home and family, feeding them, nursing some back to health, loving them. When a dear friend asked if I could say a few words about her love, care & attention to our furry legged friends I didn’t hesitate to add my “recommendation”. 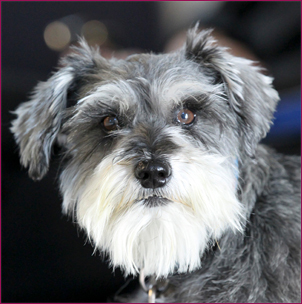 I have known Laurie for many years as a personal friend and now a veterinary client of my clinic. Since I have known Laurie she has multiplied her fur family many times. She has adopted, rescued & adopted to keep for herself many senior dogs that were able to spend their last years in her loving arms. Never a conversation between us has not included the newest additions to the family whether it is her own, temporary doggies waiting for their forever homes, or the lucky ones that come to stay for a visit “vacation” at her home. With rescue dogs you are faced with many challenges – health and behavioural. 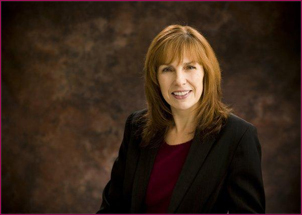 Laurie has had many cases to learn and gain experience in dealing with both issues equally. 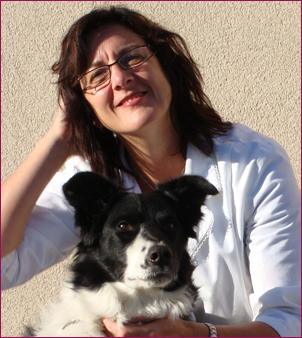 Laurie is very conscientious and has never hesitated to give me a quick call for advice with questions regarding potential health issues, behavioural and follow up care for dogs in her care. I am very excited to hear that she is finally able to make her passion a reality and make work of her passion. Tiny Pawz Bed, Bark & Breakfast is exactly what dog owner’s need when searching for that special place where one can breathe a sigh of relief that their loved fur family will be warm, cozy, & tuckered out at the end of the day. She will be providing a low stress environment much akin to hanging out in the “living room”. I have no hesitation in recommending Tiny Pawz to new and existing clients. So it is with much enthusiasm that I am able to provide a little history and big congratulations to Laurie and Tiny Pawz Bed Bark and Breakfast. Tucker and I had the pleasure of staying with Laurie and Terry this past summer. 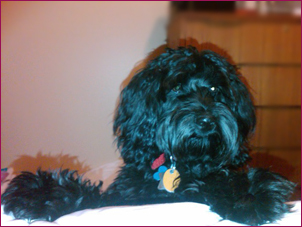 Immediately upon arriving Tucker became a part of Laurie's "fur" family and she treated him as if he was one of her own. Laurie has a true appreciation of dogs. Her love, understanding and patience never fails and she truly enjoys all of their funny quirks. It's only fitting that she starts Tiny Pawz Bed, Bark & Breakfast. My only wish is that we lived closer so we could visit more often. I have known Laurie Ryan for approximately 5 years. We have been working together from afar with our rescue, Tiny Paws Dog Rescue, and also with another rescue prior to that. She has been an enormous help with many of our dogs, and has risked her own health with some of our sick dogs, who had it not been for Laurie, would have been euthanized at a shelter. Laurie was instrumental in bringing these dogs back to health and made it possible for them to be adopted into wonderful new homes with a truly happy ending. I would trust any of my personal dogs in Laurie's care, as she has always been an over the top dog owner, and is immensely knowledgeable about care and the well being of any animal. Laurie is one of the kindest and most loving dog owners around. Not only does she treat her own 4 little dogs like gold but she has also opened her home on countless occassions to dogs in need. Her passion for animal care and her tenacity have saved even the most sick dogs in need. While I worked for the Calgary Humane Society, Laurie responded to every single request I made to her for help with special, small dogs who were not adoptable at the shelter; this included taking on two small yorkies with ringworm when no one else would. As a professional dog trainer I know how difficult it is for clients with small dogs to find a quality petsitter or daycare facility. It is important for small dogs to have a safe place to play where they don't have to worry about their larger compatriots accidently injuring them. I would not hesitate to recommend her bed, bark & breakfast to any of my clients with small dogs as well as send my own furkids to her. Laurie belonged to that rescue association and she quickly arranged for Sage and Billy to be shipped from Kelowna to Calgary where she planned to foster them in her home in Okotoks until a good permanent home could be found for them. She fell in love with them instantly. When it became apparent to her that the rescue association intended to adopt Sage and Billy separately in spite of her strong recommendation that they be adopted out together, she broke away from the organization. She was so committed to Sage and Billy’s best interests that she paid all of the considerable costs associated with their rescue – shipping costs, veterinary check ups, dental cleaning, and adopted them both herself. Sage and Billy now had a new home and a new family to love them. 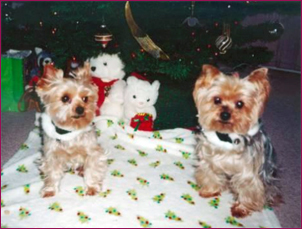 Laurie, her husband Terry and two yorkie siblings… Frodo & Gizmo. When Sage and Billy had first been taken into Laurie’s care, I had asked her to please let me know where their new home would be… when she called and told me that she was adopting them herself, I was ecstatic. Laurie and I had talked together about Sage and Billy many times and she has always struck me as so loving and genuine in her concern for them that I couldn’t have wished for a better outcome for them. Laurie and her family proceeded to shower Sage and Billy with love and attention and I received frequent updates and photos of the two of them enjoying their new life. Billy died in December of 2007 of heart failure. Sage died in February of 2008 of a brain tumor. It was devastating to all of us, however, it was a comfort to know that they had remained together in Laurie’s care right to the end. We finally got to meet Laurie in June of 2008. We had a family situation to deal with in Winnipeg and called to see if we could meet her on our way through Calgary. When she learned of the circumstances of our trip she not only offered but insisted on looking after Maxi for us for the week that we would be gone. It meant so much to us knowing that Maxi was in safe, caring environment. Laurie is involved with Tiny Paws Dog Rescue – caring for dogs is just who she is – and now she is starting a Bed, Bark & Breakfast. I know this venture is a labor of love to satisfy her boundless need to care for these little creatures that we love. She is loving, caring, dependable and trustworthy. 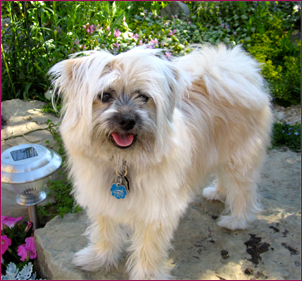 I have no hesitation in recommending her as a caregiver for your little furry friends. Any dog would be lucky to spend even a small part of his or her life with Laurie. A lucky few of these dogs got to live with Laurie and are still there to this day she sent me adorable pictures of all of the dogs, every step of the way, kept me informed. 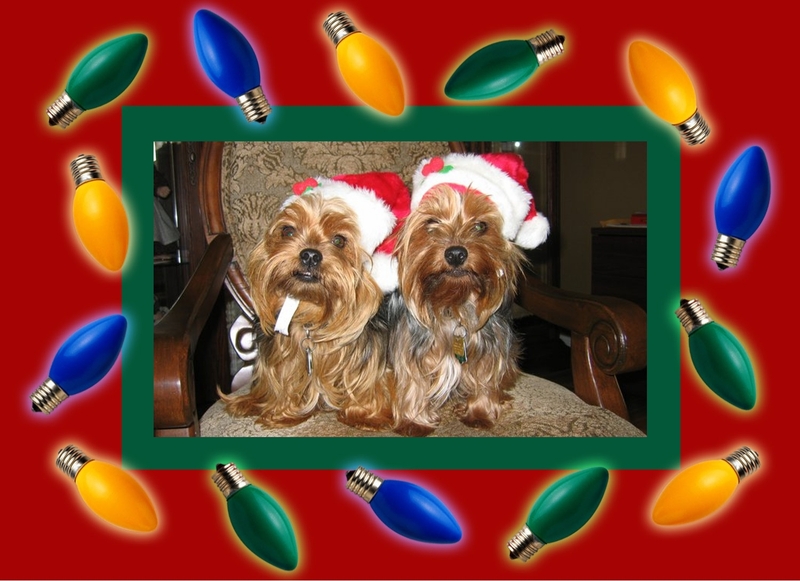 (I especially loved the pictures of the puppies as they cuddled with her family and then grew into the cutest Yorkie/Min Pin crosses!) I was so grateful to know that the dogs all had good homes. I would not hesitate to have Laurie care for my dogs – they couldn’t possibly be in better hands. My yorkie Hudson, and I are overly excited about how well his first day went at day care. I was very leery about sending him to a day care because I was afraid of him getting hurt by the bigger dogs. You would understand my excitement when I stumbled across Laurie's site, for a "small dog only" day care. I messaged her with many questions, and she answered back within minutes explaining everything to me. She told me I could come and meet the family and check everything out before I dropped him off so I knew he was in good hands. As soon as I met Laurie I knew what a great caregiver she would be. Not only did she have four other of the same breed of puppies, but she was so happy to meet Hudson, and show me around. When I dropped him off this morning I had no doubt in my mind that he would have a great time. She messaged me throughout the day with updates and pictures of Hudson. She took them for walks, and played with them in the snow. When I picked Hudson up at the end of the day, she had "school pictures" of him for me, as well as a treat that he had liked to go home. I think Hudson wanted to stay and be a part of her family! Laurie is an amazing person, and her kind heart shows as soon as you meet her. She is the best person in the world I could think of to watch my precious little boy and I would recommend her to anyone! I will pass along your kisses to Daisy. The girls couldn't decide who would get to sleep with her tonight so all three are snuggled up together and sound asleep. Talk to you soon. We were so very fortunate to have found a place like Tiny Pawz and Laurie Ryan to look after our precious little sick puppy who loved her stay there. Laurie was so, so good with Baillie. Baillie had a heart condition and was quite sick but Laurie, I know for sure, gave our little sweetheart so much love, that Baillie was a very happy dog at Tiny Pawz. Laurie had her retrained to eat properly and even got a better figure from her little exercise excursions. This is one place that I would take a little puppy no matter what the cost because the care Laurie gives is just phenomenal. 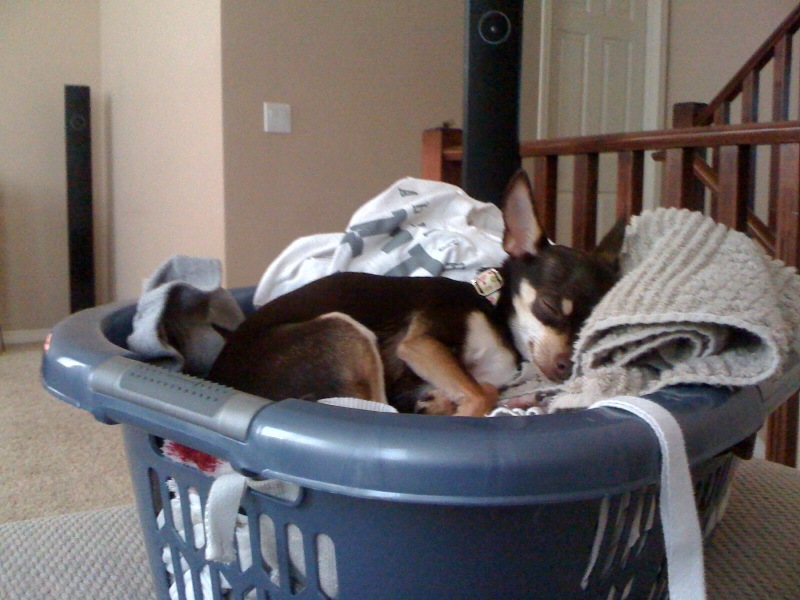 Leaving my little Chihuahua, Chanel, is one of the hardest things to do. I worry that she would be left with a stranger that will not give her enough attention or worse, that she will get hurt or lost. 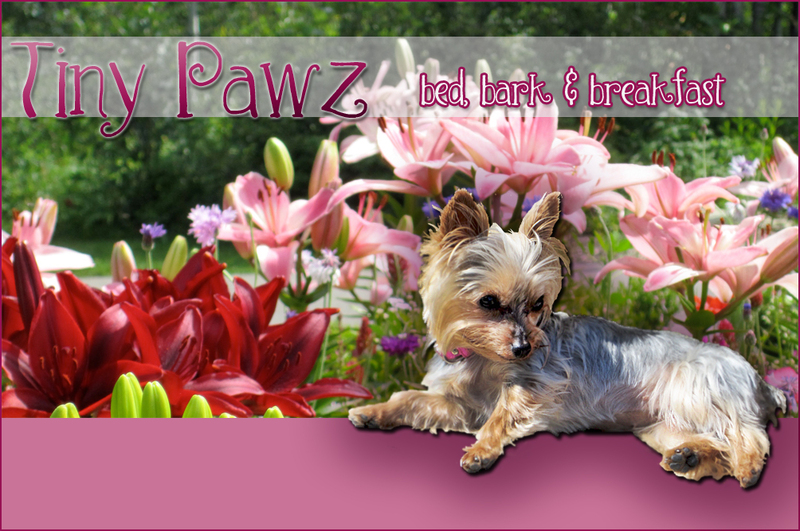 When I came across Laurie’s business “Tiny Pawz Bed and Breakfast,” it caught my attention right away. After reading her website and looking at many pictures, I realized this place was different from any other place. First of all, Laurie only looks after small dogs, which really caught my interest. I have heard a few stories about small dogs getting hurt by bigger dogs at day care so this put me at ease. Also, Laurie had posted plenty of pictures of all the dogs she looked after and I could see that they all got plenty of attention from Laurie and her family. Also, the place looked very nice and clean and Laurie herself has a few yorkies so I knew Chanel would have some furry company to play with. When I went to meet Laurie she took me on a tour of her place. She has plenty of space for the dogs to play inside and a separate house for them outside. 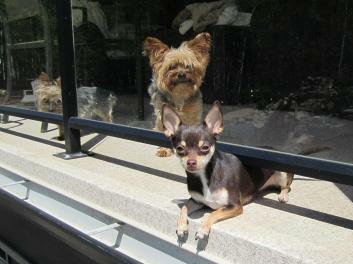 When I went to see other pet sitters, most of them would leave the dogs outside in the backyard. I do not like this idea because I feel like anyone can come and take the puppies or they can get out and that it’s just not safe or clean. However, Laurie’s play house out back is beautiful. It’s like a little mansion for the dogs. She has two rows of beds for the dogs to sleep in and scents to keep them comfortable as well as plenty of toys. Also, this area is completely fenced off and safe and the dogs can go and come as they please in the house and outside. They also have an area outside to play (also fenced off) and to do their business. Laurie also has pee pads set up in her laundry room for dogs that prefer to use the mats. Another thing that sets Laurie apart from other places, is that she has a camera monitoring system set up in her kitchen which is connected to the play house outside so she can always see where the dogs are. This really gave me a feeling of comfort. Upon meeting Laurie, you can tell right away how much she loves dogs. She gives them plenty of attention and play time. When I have taken Chanel to other pet sitters for a meet and greet, they normally just ask me questions and don’t interact with my puppy. Laurie started playing with Chanel right away and I got a chance to see how much Chanel liked Laurie. 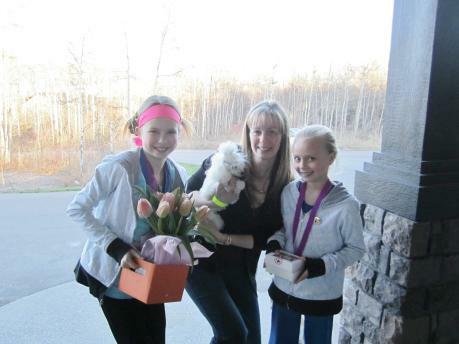 Instantly, Chanel jumped up on the steps and sat next to Laurie and gave her kisses. I had never seen her do that with anyone else so I knew how much she liked Laurie. Furthermore, when I came to meet Laurie, her husband Terry also stayed home and waited to meet me and my husband. He also played with Chanel so I got a chance to see how everyone that would be around Chanel would treat her. Laurie also asked me plenty of questions about Chanel and also offered to sleep with Chanel in her bed J That was one of the things that really made me feel comfortable. Chanel always sleeps with me so I always worry she will be lonely when I am away. But Laurie treated her just like her own dog. When I was away, Laurie sent me emails, texts, and videos of Chanel throughout the day. She also responded quickly to her emails/texts. This made me feel better because I could see what Chanel was up to everyday and it helped me enjoy my trip. Normally, I worry too much about her to enjoy being away from home. Laurie helped me feel completely comfortable because I knew Chanel was in good hands. Laurie also offers to make you a DVD of your pet’s stay. All in all, I loved Tiny Pawz and I know Chanel did too. She fell in love with Laurie and followed her everywhere. Tiny Pawz is the best place to leave your dog because she gives them plenty of love and attention and all the dogs are perfectly safe. I will always bring Chanel to Tiny Paws.